We're not here to tell you how to get over your ex. Go ahead: Start a noise band, work out all the time, or get a zoo to feed a cockroach named after your ex to a meerkat on Valentine's Day (yes, that's real). Maybe that last one seems a little harsh? If so, we have a charming alternative for you. 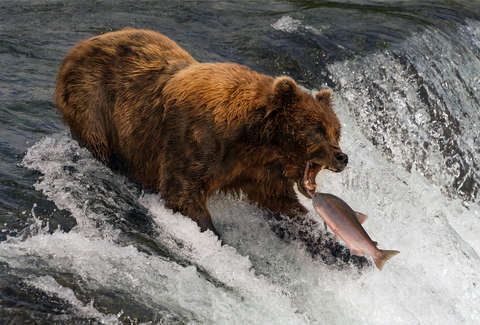 Instead, get this wildlife center to name a salmon after your ex and feed it to a 1,000-pound brown bear on Valentine's Day. It's a much more tasteful way to gain closure. This invaluable service is provided by the Wildlife Images Rehabilitation Center in Oregon, and all you have to do is donate $20. You can sign up for the "Catch & Release" promotion here. Best of all, you'll even get a certificate and photographic evidence of the two bears, Kodi and Yaki, consuming the fish that bears (lol) your ex's name. If you're more fixated on the person you're currently in love with, you can name a fish in their honor (?) that will also be fed to a brown bear. Which is, um, a nice gesture? You'll still get the photos and certificate. Alternatively, you could see a therapist.